Until late 2006, Interstate 494 crossed the Mississippi River on the 1959-built Wakota Bridge. A multi-year, often delayed project, replaced this steel through arch bridge from 2002 to 2010. The replacement span accommodates ten overall lanes and a bike/pedestrian path between South St. Paul and Newport. Photo taken by Chris Lokken (07/13/06). Interstate 494 forms the southern and western quadrants of the 73-mile Twin Cities beltway system while Interstates 94 and 694 travel along the northern portion of the loop from Maple Grove east to Oakdale. I-494 and I-694 share end points and an exit numbering system. Exits 1A and 1B are located south of the Minneapolis St. Paul International Airport (MSP) in Bloomington. Numbers count up as I-494 travels clockwise and reset at the Minnesota River. 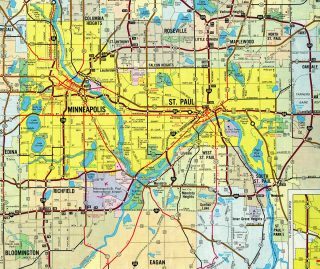 A mostly suburban commuter freeway, Interstate 494 extends for 42 miles serving communities such as Plymouth, Minnetonka, Eden Prairie, Bloomington, South St. Paul and Woodbury. The route overlaps with Minnesota 5 from U.S. 212 (Exit 11C) to the airport (Exit 1A) along the locally known Bloomington Strip. The north-south segment from Eden Prairie to Interstates 94/694 at Maple Grove parallels a transmission corridor. Long range plans will upgrade the 1960s-built full cloverleaf interchange between Interstates 35W and 494 on the Bloomington and Richfield city line. Studies in 2014 outlined two interchange designs for the exchange: the Turbine concept and the Clovermill concept. The Turbine adds flyovers in all directions with the exception of I-35E south to I-494 east, while the Clovermill design only adds a flyover from I-35E north to I-494 west. Both were evaluated in their ability to improve congestion and safety while providing a cost effective solution. The Turbine concept was carried forward by 2014.10 See the I-494 and I-35W Study home page for more details. 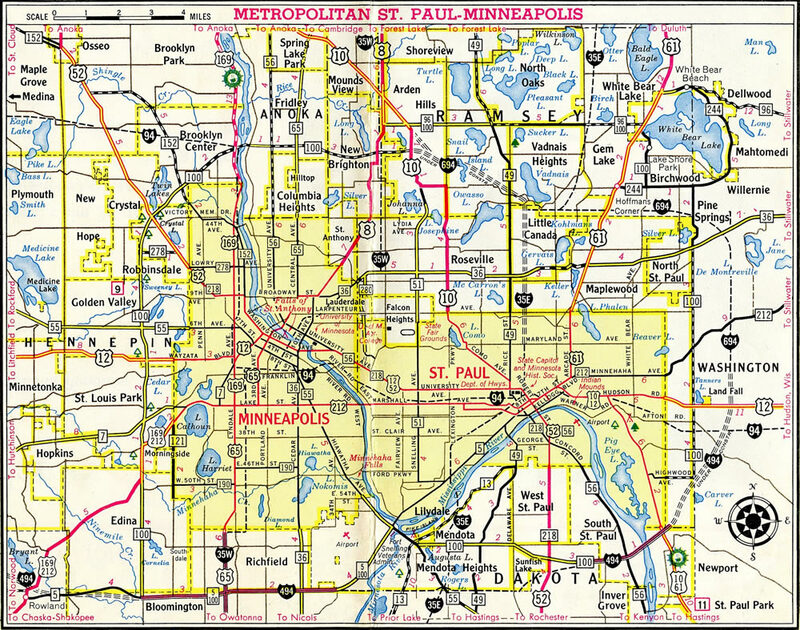 Minnesota 100 was dropped along I-494 through Bloomington by 1963. 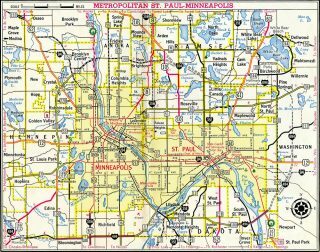 The east-west section north of Minneapolis and St. Paul was decommissioned in 1965 as Interstate 694 was completed. 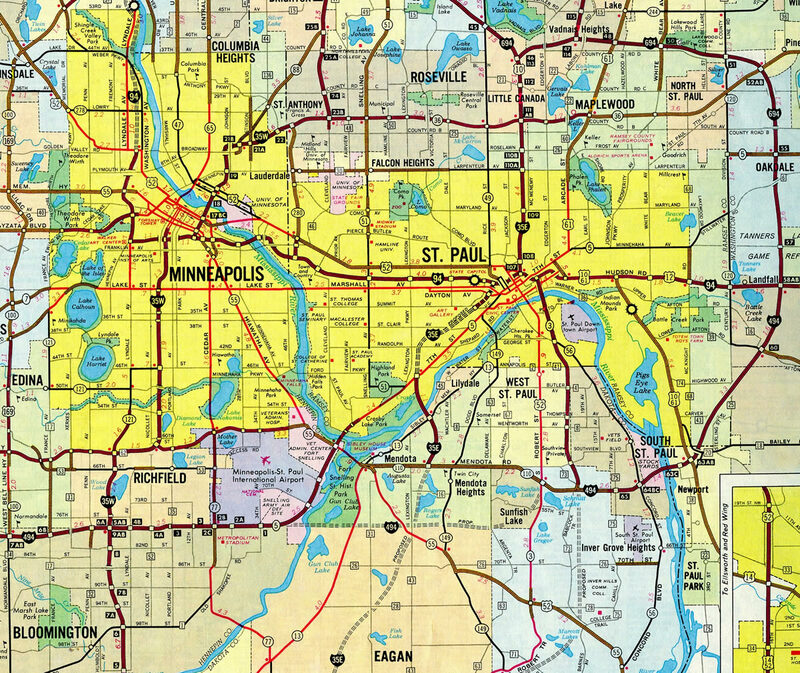 Remaining stretches east of St. Paul and south of St. Paul were renumbered as Minnesota 110 and 120 respectively. Interstate 494 directly overlaid Minnesota 110 from Robert Trail (old U.S. 52) east to the split diamond interchange (Exit 65) with 7th and 5th Avenues in South St. Paul. Interstate 494 travels 1.25 miles north from the parclo interchange (Exit 59) with Valley Creek Road to meet Interstate 94 & U.S. 12 at the Oakdale city line. Photo taken 06/14/15. Exit 58C loops away from I-494 north to Tamarack Road in Woodbury. Exit 58B follows in one half mile for Interstate 94 & U.S. 12 east to Afton, Lakeland and Hudson, Wisconsin. Photo taken 06/14/15. An end sign for Interstate 494 north precedes the beltway transition to Interstate 694 north. I-694 extends the belt line through Oakdale and White Bear Lake. Photo taken 06/14/15. Exit 58B departs for Interstate 94 east to Eau Claire and Madison, Wisconsin. U.S. 12 accompaies the freeway to Exit 4 in Wisconsin. The route is unsigned along I-94 between Minneapolis and the Saint Croix River. Photo taken 06/14/15. Traffic bound for I-94 (and U.S. 12) west into St. Paul leaves as I-694 takes over northward to CSAH 10 in Oakdale. I-694 serves the northern suburbs of Vadnais Heights, Arden Hills and Fridley among other cities. Photo taken 06/14/15. This ground level interchange sequence sign referenced I-94 at one mile out at the Valley Creek Road overpass. It was replaced by an overhead assembly during expansion of I-494 to six lanes in 2009-10. Photo taken by Chris and Amber Lokken (01/08/07). More sign changes were made during the 2009-10 widening of Interstate 494, as the freeway now carries seven overall lanes between Tamarack Road (Exit 58C) and Interstate 94 (Exits 58B/A). Photo taken by Chris and Amber Lokken (01/08/07). I-694 south transitions to I-494 south in 2.5 miles at Interstate 94. The last mainline exit connects with CSAH 10 (10th Street North) in south Oakdale. Photo taken 04/23/07. A parclo interchange (Exit 57) joins I-694 with Washington County 10 (Tenth Street North) just to the north of Interstates 94 and 494. Photo taken 04/23/07. Beyond the on-ramp from CSAH 10, drivers see an end I-694 / begin I-494 sign. Photo taken 04/23/07. Interstate 494 takes the Twin Cities beltway southwest from Interstate 94 to Newport and Interstate 35E at Mendota Heights. I-94 bisects St. Paul to the north while linking Downtown with Downtown Minneapolis. Photo taken 04/23/07. Exit 58B follows for Interstate 94 & U.S. 12 across the eastern suburbs to Hudson, Wisconsin. U.S. 12 parallels the I-94 corridor southeast to Madison. Photo taken 06/15/15. Interstate 94 advances two miles east from the Conway neighborhood of St. Paul to the joint end point for I-494 north and I-694 south. Photo taken 04/21/07. No control cities are used for the Twin Cities beltway along Interstate 94. The two freeways come together in one mile along the Oakdale and Woodbury city line. Photo taken 04/21/07. Exit 249 departs from I-94 east as a collector distributor roadway for Interstates 494 south and 694 north in 0.6 miles. Photo taken 04/21/07. Interstate 694 bisects the city of Oakdale north from Exit 249 to Minnesota 36 at Pine Springs. the route turns west from there to White Bear Lake. Photo taken 04/21/07. Interstate 94 maintains six overall lanes as the two-lane c/d roadway separates for I-494 and I-694. There are no long range plans to upgrade this cloverleaf interchange. Photo taken 04/21/07. Single lane ramps take motorists onto the Twin Cities beltway from Interstate 94. I-494 south carries six overall lanes while I-694 remains with just four lanes north to I-35E. Photo taken 04/21/07. Interstate 94 & U.S. 12 west expands to four then five lanes from Exit 250 with CSAH 12 (Inwood Avenue) to the collector distributor roadway (Exit 249) for Interstates 694 north and 494 south. Photo taken 04/23/07. Forthcoming Interstate 694 north takes motorists to I-35E at Vadnais Heights and U.S. 10 west at Arden Hills. I-494 south provides a bypass for I-35E south through Eagan and Apple Valley. Photo taken 06/15/15. Westbound Interstate 94 and U.S. 12 split with Exit 249 for Interstates 494 and 694. The first ramp connects to I-694 north, which passes through Oakdale, then turns west to serve White Bear Lake, Maplewood, Shoreview, New Brighton, Fridley, Brooklyn Center, Brooklyn Park and Maple Grove. Photo taken 04/23/07. The northbound off-ramp to Interstate 694 parts ways with the c/d roadway. Photo taken 04/23/07. Interstate 494 leads motorists south and west from I-94 & U.S. 12 to Mendota Heights, MSP Airport, Richfield and Bloomington. Photo taken 06/15/15. This is the first sign advising of the pending interchange with Interstate 94 (and U.S. 52) and Interstate 694 on I-494 north. The final I-494 exit joins the belt line with Hennepin County Route 10 (Bass Lake Road) on the Maple Grove and Plymouth city line. Photo taken 04/22/07. Attached to the Hennepin County Route 10 overpass, this overhead sign advises that Interstate 494 ends in 1.25 miles at the exchange with Interstates 94 and 694. U.S. 52 is omitted, which is consistent with Minnesota Department of Transportation (MnDOT) signing practices for U.S. highways merged with Interstate highways for long durations. Photo taken 04/22/07. Interstate 494 originally carried just four lanes from CSAH 10 to Exit 27 with Interstate 94 west. Reconstruction of the freeway during 2014-16 added a third lane in each direction. Expansion of the road removed this sign bridge and state-named shield, the last for I-494 north, by fall 2015. Travelers otherwise separate at ramps for Interstate 94 west to Rogers and Albertville and I-94 & 694 east to Brooklyn Park and Fridley in one mile. Photos taken 04/22/07. A third lane for I-494 north previously emerged at the East Fish Lake Road overpass. The mainline defaults onto Interstate 94 west to St. Cloud. Photo taken 04/22/07. Northbound Interstate 494 ends as traffic splits for Interstates 94/694 (and U.S. 52). I-694 returns the inner belt east to White Bear Lake and south back to I-94 at Oakdale and Woodbury. West beyond St. Cloud, I-94 travels to Fargo, North Dakota and over the former U.S. 10 alignment to Interstate 90 at Billings, Montana. Photo taken 04/22/07. This interchange sequence sign posted one mile ahead of the I-494/694 split, appears along I-94 & U.S. 52 east within the parclo interchange (Exit 215) with CSAH 109 (Weaver Lake Road). Note the absence of a U.S. 52 shield; U.S. 52 is barely signed (if at all) anywhere along its shared alignment with Interstate 94 in Minnesota. Photo taken 04/23/07. Interstate 94 travels between residential areas of East Fish Lake Road and the Elm Creek Boulevard retail corridor directly to Exit 216 and the Twin Cities belt line. Interstate 494 leads south to Plymouth and Minnetonka while Interstate 94 east continues to Minneapolis and St. Paul. Per area signage, the best bypass around the metropolitan area is via Interstate 694 east. Photo taken 06/14/15. Traffic separates at Exit 216 with two lanes joining I-494 south to Eden Prairie and two lanes for I-94 & 694 east to Brooklyn Park and Brooklyn Center. Photo taken 06/14/15. This interchange sequence sign provides the distance to the last I-694 exits (all numbered based on Interstate 494-694’s mileage). Photo taken 04/23/07. Interstates 94 & 694 meet the U.S. 169 freeway at a full cloverleaf interchange, 2.5 miles ahead of the I-694 end and I-494 south beginning. Photo taken 06/16/15. Continuing west from U.S. 169, I-94 & 694 pass between a quarry and residential subdivisions leading to a folded diamond interchange (Exit 28) with Hennepin County 61 (Hemlock Lane). Interstate 494 south departs from the left in less than two miles. Photo taken 06/16/15. Westbound Interstates 94 & 694 reach the off-ramp (Exit 28) to CSAH 61 (Hemlock Lane). Construction during 2014-16 rehabilitated the concrete pavement of I-494 from Maple Grove south to Plymouth and Interstate 394 & U.S. 12. Additional work also replaced the I-494 bridges at CSAH 47, Schmidt Lake Road and the Canadian Pacific Railway and added auxiliary lanes between MN 55 and East Fish Lake Road. Photo taken 06/16/15. Interstate 494 south extends the belt line exit numbering system from Exit 27 (the continuation of I-94 west). Interstate 94 and hidden U.S. 52 west travel 43 miles northwest to St. Cloud. Beyond there, truck traffic dissipates on the rural trek to Fergus Falls and Moorehead. Photo taken 06/16/15. Entering the three-wye interchange (Exit 29) with the departing Interstate 94 west and ending I-694. Interstate 494 leads south to U.S. 212 at Eden Prairie and east along the Bloomington Strip. Connections with U.S. 12 take motorists west to Wayzata and Orono. Photo taken 06/16/15. Twin Cities Interstate System (Adam Froehlig). “Work Begins On Wakota Bridge Project/$206 Million Endeavor Includes I-494, U.S. 61.” St. Paul Pioneer Press (MN), November 21, 2001. “Wakota Project Inches Forward.” St. Paul Pioneer Press (MN), December 6, 2003. “Design Problem Delays Wakota Bridge Opening – Officials Worry About Spring Barge Traffic.” St. Paul Pioneer Press (MN), August 17, 2005. “Repairs Delay I-494 Bridge Opening – South St. Paul Project’s End Date Pushed Back A Year To 2008.” St. Paul Pioneer Press (MN), December 2, 2005. “Troubled I-494 Bridge Project Hits New Snag – Another Delay Expected After MnDOT Ousts Contractor In Dispute Over Rising Costs.” St. Paul Pioneer Press (MN), December 29, 2006. “I-494 Bridge Bid Double Original Estimate – $60.1 Million Proposal To Finish Troubled Project Costs $3 Million More Than Builder’s 2006 Offer.” St. Paul Pioneer Press (MN), January 26, 2008. “Bridge Settlement Speeds Timetable – Completion of Wakota, I-494 Work Planned By July 2010.” St. Paul Pioneer Press (MN), November 26, 2008. “Finally, a wider Wakota – A headache for Dakota and Washington county drivers is nearly over. Construction of the new bridge — overbudget and snarling Interstate 494 at U.S. 61 for seven years — will be complete early next month.” St. Paul Pioneer Press (MN), June 27, 2010. I-494 / I-35W Interchange Fact Sheet 5 – Transitway Concept Refinement, April 2014. Minnesota Department of Transportation.